The Ryobi OCS1830 18v Cordless Chainsaw, 30cm bar, with high performance brushless motor. 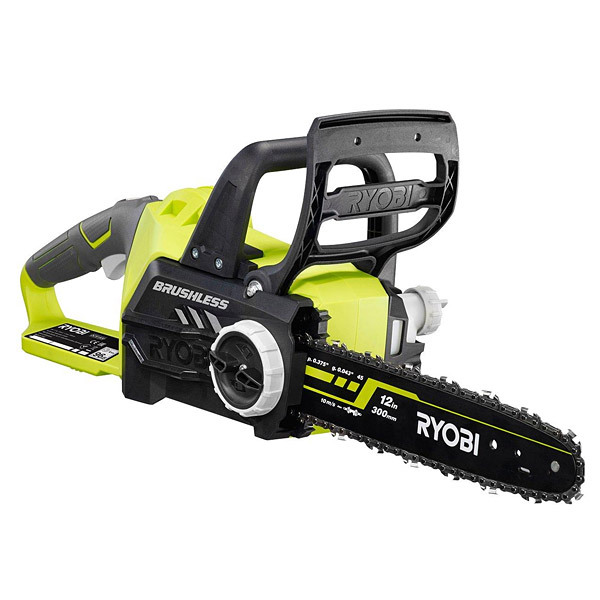 Ryobi’s first ever much anticipated ONE+ chainsaw - the latest addition to the ONE+ system. Ideal for chopping small trees, branches and logs. Zero Tool version (no batteries or charger supplied). Compatible with the Ryobi ONE+ range of 18 volt batteries. The OCS1830 is extremely portable thanks to its light design. Weighing just 2.5kg without the battery pack, it is easy and comfortable to use wherever you’re operating. It has a 30cm (12 inch) Oregon® bar and chain, plus an automatic oiling system for even greater convenience. It can also be adjusted quickly and easily thanks to tool-less chain tensioning, while a full wrap-around handle (complete with over-mould), means it can be used in any orientation, perfect when reaching for awkward areas or branches. Also with a dual brake function, boasting both a mechanical chain brake and a motor brake, you can work safely at all times. We recommend using either a RB18L40 or RB18L50 Lithium battery pack and either the BCL1418H or RC18150 Charger with this product, which will provide the optimum power and runtime for this tool.